Was it learning that Christian’s girlfriend was actually real that drove the knife into Gabby’s heart, possessing her to drive one into Christian’s back? No, I think the Big Move™ (or Big Bang) this week was far from emotional, and I don’t think it was such a terrible idea given how we’ve seen the last two season’s endgames pan out with certain powers prolonging lives in the game. 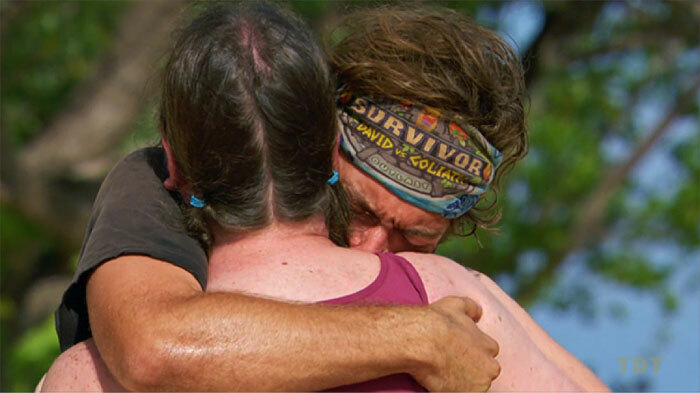 The Survivor gods just favored one nerd over the other. “Go big or go home” as they say, or in this case, I guess both? WHAT KIND OF MOVE WAS THAT? The Kentucky wildcat was out for blood after that blindside — also after that shortest “Previously on Survivor” recap ever. Nick criticized Gabby and Christian for making the move against Carl, citing that they were “so smart they’re dumb.” The lawyer made his case as to why he was pissed and, frankly, it was kind of foolproof. 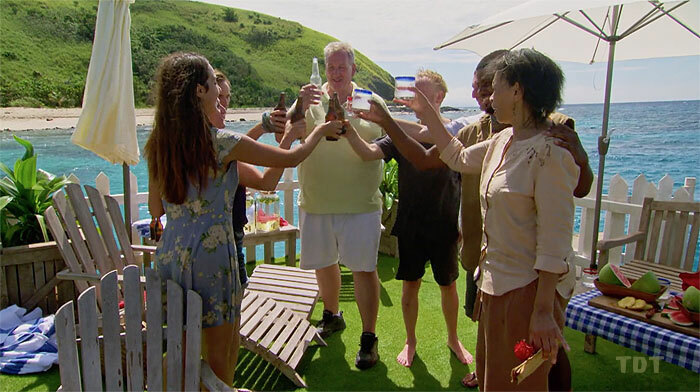 From Nick’s perspective (last week’s magic word), the Davids played all their cards to get the upper hand on the Goliaths, and as soon as they got it, Christian and Gabby gave it away by voting out Carl. Having no Goliaths formally committed to a new plan going forward, it did look a little on the silly side. Thus, the night started off rough for Mason-Dixon as Nick swore that he was ready to make a move against Christian as soon as he had the chance. One could say we had a real Civil War on our hands. 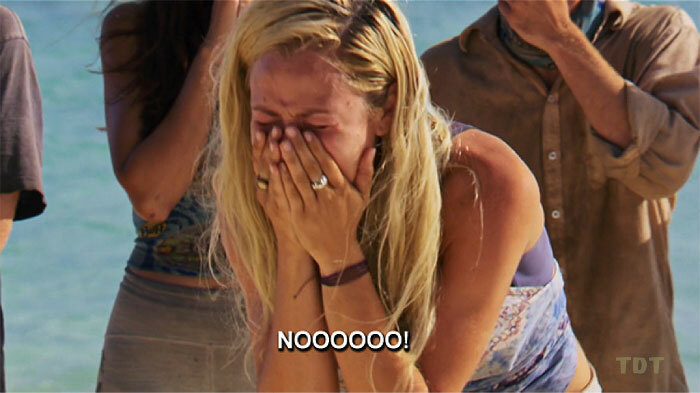 With as many items the show has cut over the years such as the Survivor auction, a new location every season, and most recently decisions at Final Four that actually matter, I’m glad we haven’t lost the loved ones visit (only a few times has this been cut in seasons featuring Redempshit Island and when Cambodia kept trying to kill people). We all get a lot of enjoyment out of seeing who has the craziest mother, brother, or assistant coach. 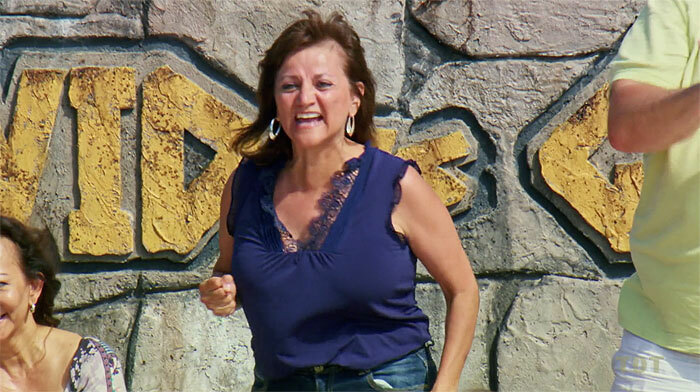 Sadly, this season we had no Aunt Patty, but there were still some who came packing a punch. Like I said last week, I was hoping we’d meet Christian’s dad because I can only imagine what he’s like, but instead we saw a softer, sweeter side to Christian watching him reunite with his girlfriend Emily. It was true love indeed, much in contrast with Mike who almost refused to stand within three feet of his boyfriend Josh. Maybe they’re just not big on PDA which I can respect and appreciate. 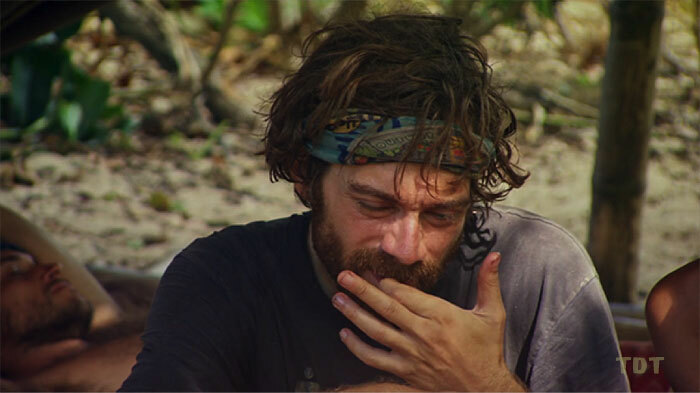 I didn’t need to see another face-eating session like we had with Rupert and Laura Boneham in All-Stars — talk about putting the bone in Boneham. I’m also glad Kara got to see her brother come out from behind the trees. I had the slightest concern given that the show’s on a smaller budget now that they’d save some airfare and give Kara someone who only claimed to be her loved one. 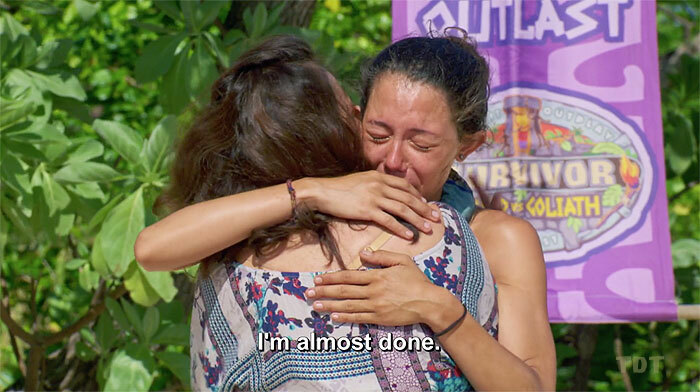 I didn’t think much of it during the live show, but there was also a funny line from Gabby as she embraced her mom that ended up foreshadowing how the rest of the night would be going. Past Survivors have mentioned before how it’s never a good idea to win this particular challenge and have to divvy out love, giving some elation and others envy. I too would throw this one and hope that I got selected to go along on the reward — if not, I’d wave goodbye to my mom and tell her I’d see her soon before I returned to camp to start throwing the winner under the bus. The only person not-so-sold on the idea was Davie who worried about what it’d look like at the end with three people who had spent a significant amount of time together on the tiny tribe of Jabeni. If not for Davie, I could have easily seen this group getting to the end, but watching what played out, the path will definitely not be as clear. 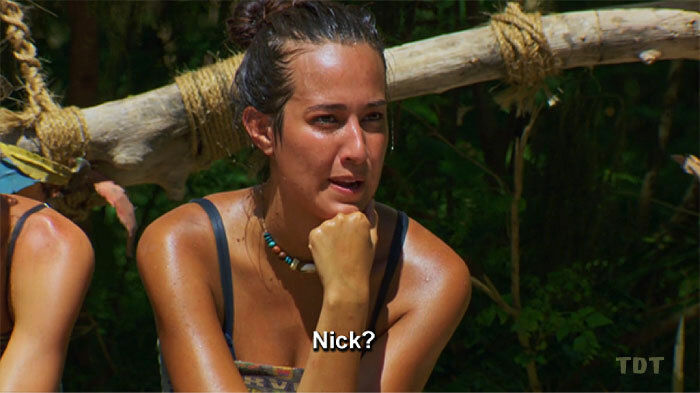 However, if I had to pick a final three at this point, I’d still look at Nick, Angelina, and Mike based on their allegiance to each other, their edits, and the rest of the tribe targeting each other. Davie would have been an easy fourth for them, but with him not 100% on board, maybe they just pick up someone else and still make it all the way? So then the question is: who’s gonna lose that famous fire-making challenge? I’m sure Gabby hates that shot, but it seemed too perfect not to place under that header! If not for the preview last week, Gabby talking about cutting Christian loose would have been the shock of all shocks. 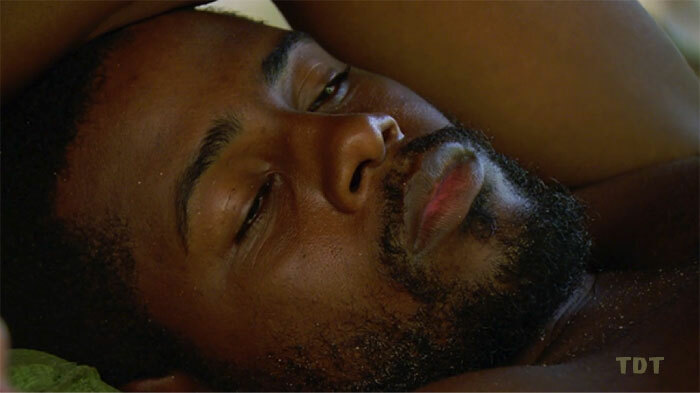 After seeing him act so comforting and caring toward Emily at the challenge, it hit Gabby that he had been the same kind of emotional support in this game for her and she worried the jury would quickly award Christian the win in the end if she faced him there. Gabby felt the moves she had made were credited too much to “Gabby and Christian” instead of just “Gabby” so she wanted to break away and show that she made her way in this game on her own. That résumé was to be hers and hers alone. Gabby sat down with Alison and Kara who couldn’t believe what they were hearing — Gabby gathering votes against Christian? After her move against the Godfather last week, Gutsy Gabby was at it again, going after all the power players. This was likely music to the Goliaths’ ears as I can’t imagine they weren’t secretly hoping the Davids would devour themselves and give the Goliaths back the numbers. 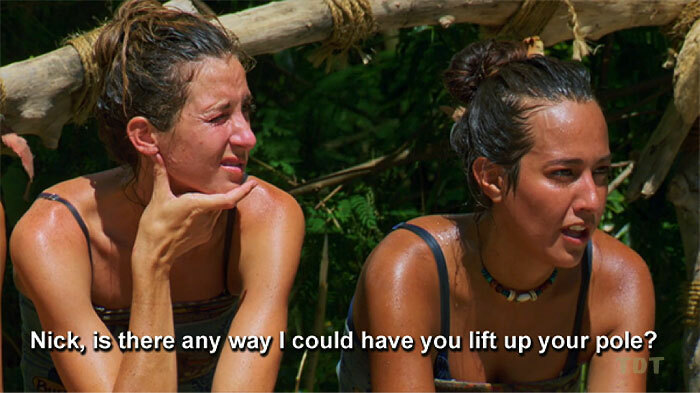 This challenge had everything we need – endurance, poles, falling buckets of water, and balance beams! 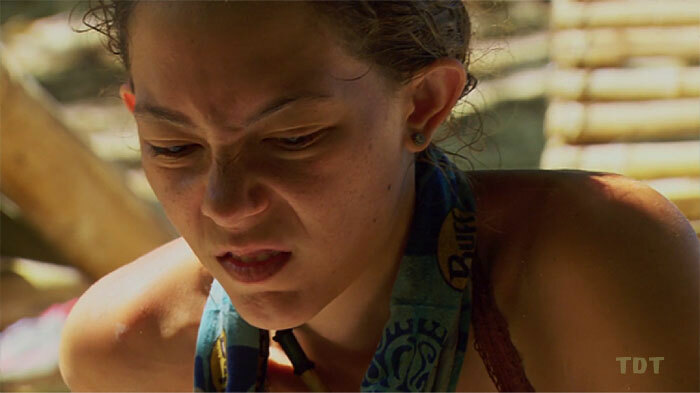 The reward winners must have been filled in after their feast that the target was Christian because after she dropped, Angelina sat on the bench doing everything she could to coach the rest of the tribe not named Christian. Not well, but at least she still won that rice deal! Luckily for Angelina and everyone else, Christian could not keep his pole up and eventually let it drop, leaving a showdown between, you guessed it, DAVID VS. GOLIATH – this time with Davie vs. Kara. I honestly don’t believe Kara moved at all in this challenge, making it another kickass performance for her. 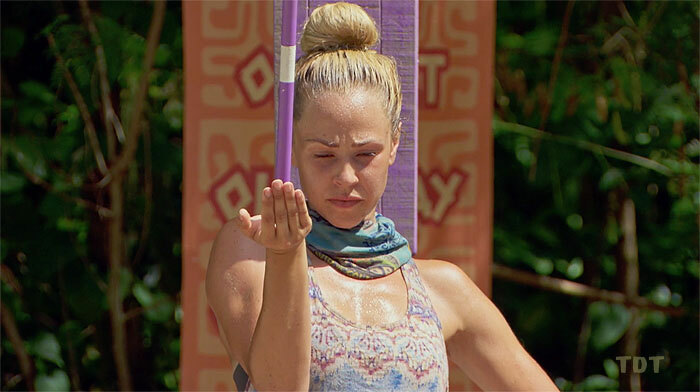 Finally, she got the credit she deserved with her first individual immunity win as Probst reluctantly placed the necklace on her. Damn women, always ruining everything for Jeff! Christian checked in with Gabby, at this point oblivious to her plotting against him, and confirmed the vote for Alison. Gabby felt the decoy boot was secure enough with Christian, so she set off to recruit the rest of the tribe to at long last remove the robotics nerd. This was naturally a decision that presented Gabby with a mixed bag of emotion but she ultimately knew it needed to be done. Having talked to Alison and Kara earlier, Gabby just needed two more votes, so she turned to former Davids Nick and Davie to help seal Christian’s fate. 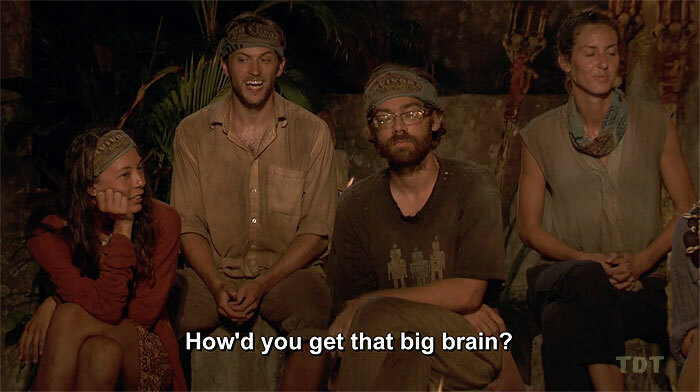 Nick was still heated by Christian’s betrayal, obviously not caring that Gabby was involved (but I suppose she was neither a Mason nor a Dixon), so he was in full support of what should have been hashtagged the #BrainiacBlindside. Davie was … again, not-so-into the plan. Davie was just not having it this week. Gabby was replaced by Angelina and Mike in the conversation and the two of them made the low-key play of the week with the idea of voting for Gabby in case Christian played an idol. Whether it was their intention or not, it meant that either way, a David would go, really giving these two all the power in the game having the Goliath girls still around as well as this new final four in force with Nick and Davie. Pretty effing brilliant if you ask me. 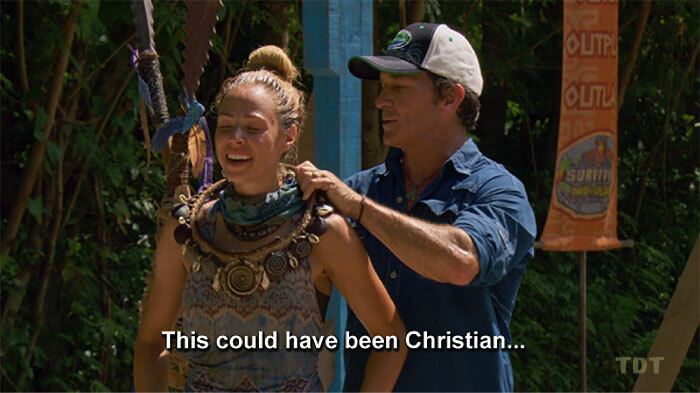 Davie came up with an equally genius idea to keep Christian in the game while not noticeably betraying anyone in the process. Davie wanted to keep using Christian as a shield, so he point-blank admitted that Gabby and Nick were against Christian. With this information, Christian knew an idol play could be called for, but he thought he could still swing the vote back his way by mending the fence with Nick. 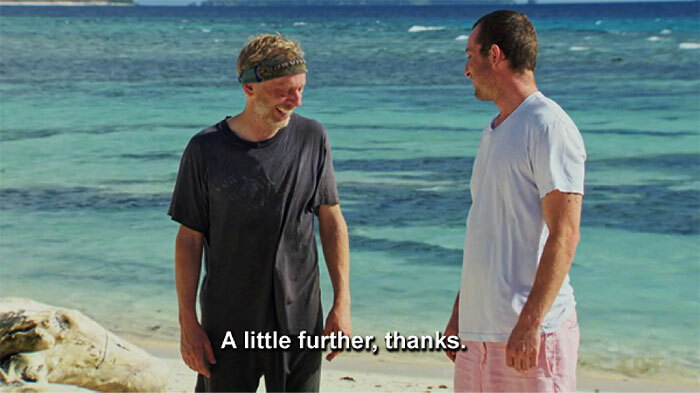 He met with Nick on the beach and apologized again for his handling of the Carl vote in hopes that the Davids would stay strong and vote out his chosen Goliath. 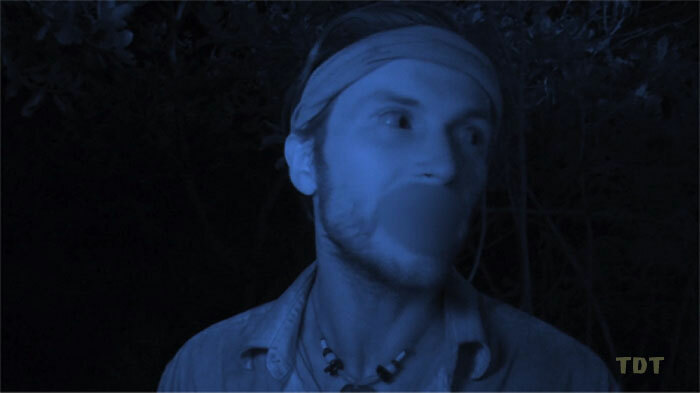 Christian then finished with an ominous confessional where he stated he’d been “right every time” which sounded like some serious “famous last words.” The title of the episode was “So Smart They’re Dumb” which had me thinking Christian may actually be bamboozled here and walk out of the game with the idol in his pocket. Right every time … except this time. Well, shoot. 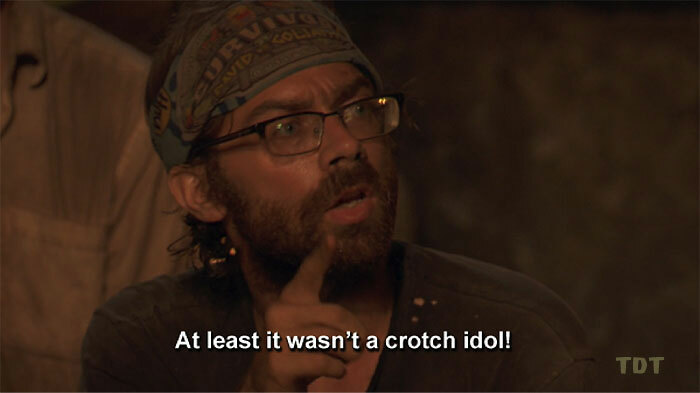 Ah, but Christian didn’t keep the idol in his pocket – he kept it in his shoe! And that shoe he would soon take off so he could give that nasty-looking idol to Jeff – probably along with an equally nasty smell. 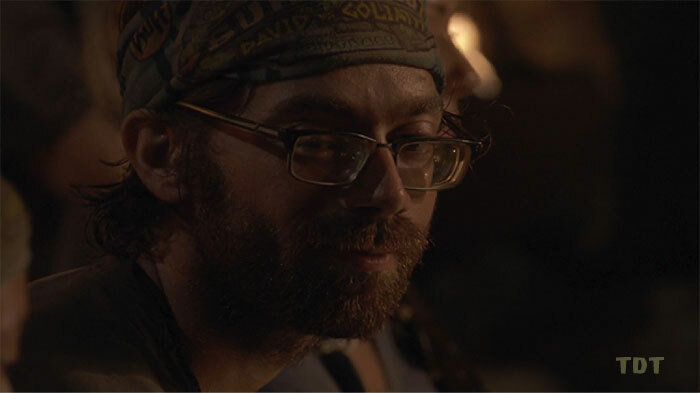 The tribe had pretty much one job here which was to make Christian feel more secure than insecure. 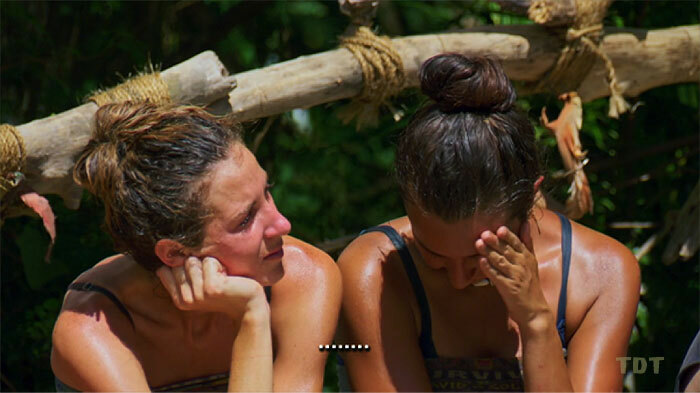 They failed that job, but even though they talked at tribal about putting people on the jury they didn’t want to sit next to in the end (obviously Christian), I’m inclined to believe Christian had them all figured out well before the vote. 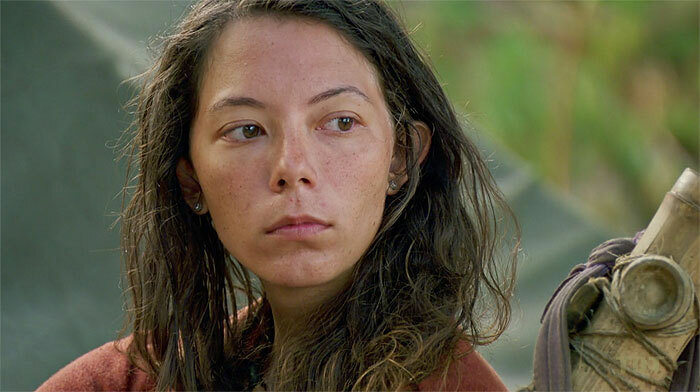 Christian’s as smart as everyone says he is and no doubt determined that based on behavior at camp — most of all probably from Gabby — that his idol would be his only option. Christian’s playing of the idol was perfect as was Gabby’s premature apologies to Alison before being blindsided herself in a bigger way than she thought she was blindsiding Christian. Angelina and Mike couldn’t help but to smirk as she voted out with that aforementioned gumption. The Goliaths had finally pulled a fast one on some Davids. 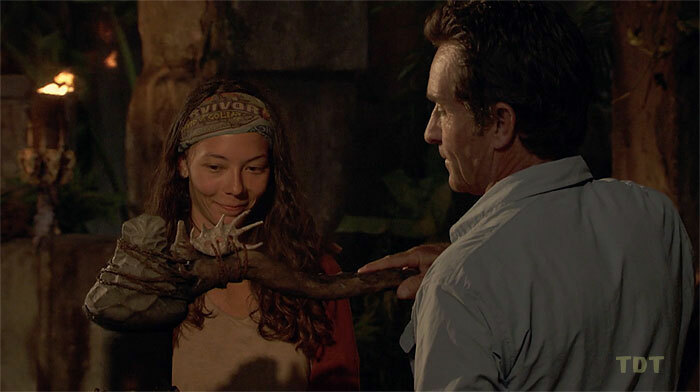 I saw Gabby as a super strong winner pick heading into the season and she had it in her, but this move just didn’t work out in her favor thanks to Christian’s idol. They really do ruin everything, don’t they? Gabby has faced a lot of criticism for crying all season long but none from me (my jokes are all in jest). She proved she has a solid head on her shoulders and though through some tears, she’s tenacious (like a squid) and totally capable of standing on her own two feet. I definitely saw the strength that the Facebook casuals are too blind to see — probably blinded by their own tears as they cry for more seasons with their precious Joe and Ozzy and how the show should “actually be about surviving” again. 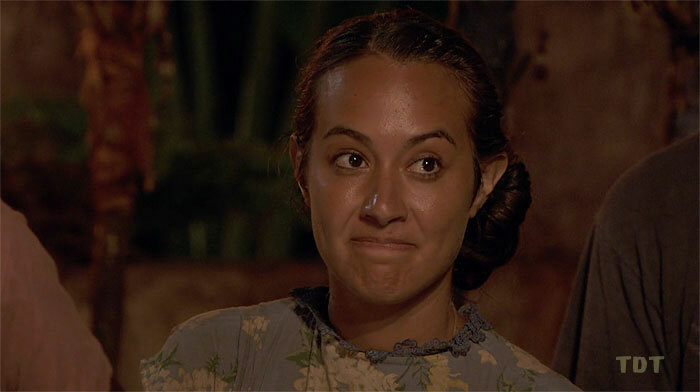 I hope to see Gabby back so she can make them cry some more as she continues to stand tall against the Goliaths of the game. 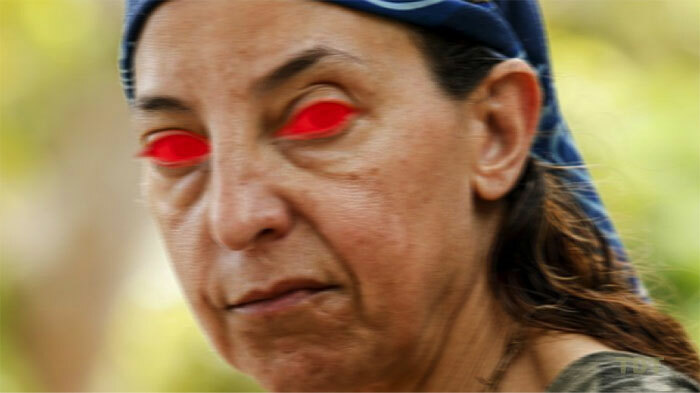 For anyone who plays Survivor fantasy, this preview was a nightmare. How are we supposed to know who’s going home when almost everyone’s name popped up here? Nick, Christian, Alison, and Davie all seem to be on the chopping block and I predict it’ll be one of those four that does end up getting chopped. Angelina and Mike have lined up the right connections now, and with her name never being brought up yet, I don’t see Kara in trouble so suddenly. 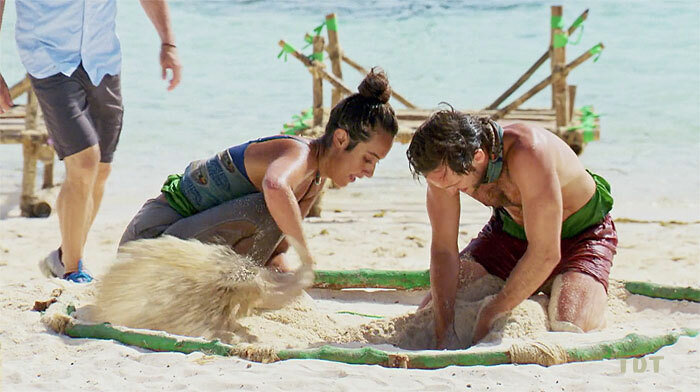 Nick has his idol, so I’m thinking it’ll be Christian and if he wins immunity then Alison, finally eliminating one of the names that have been tossed around for several weeks now. Gabby – Gabby’s big break turned out to be a big bust, but at least she dared to be bold. It’s kind of comical that last season Laurel was dragged through the mud for never making a move against her #1 and here Gabby faces backlash for doing just that. Tough call. Obviously it didn’t turn out to be right, but was it wrong of her to try? I don’t think so. The last full season she would have seen was HHH, where Gabby would have witnessed Ben play idols at final seven, six, five, and win the fire-making challenge at four, meaning the last time he was vulnerable was at eight. 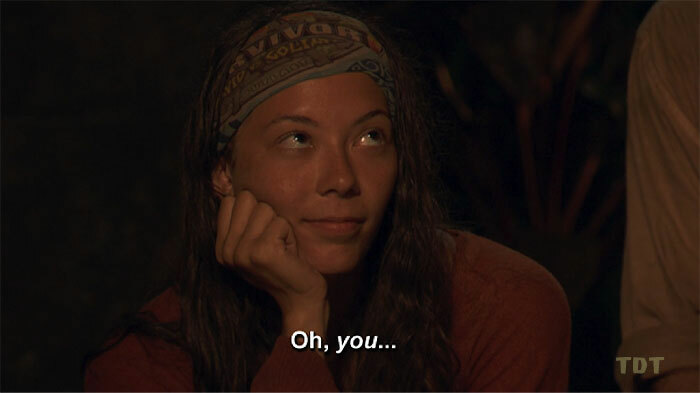 Maybe it’s only a coincidence that she made the move against Christian at this same stage of the game, but especially knowing Christian already had one idol, that evidence there proves the move wasn’t “too soon” to me. Christian – This was the nerds’ night, but in different ways for Christian and Gabby. 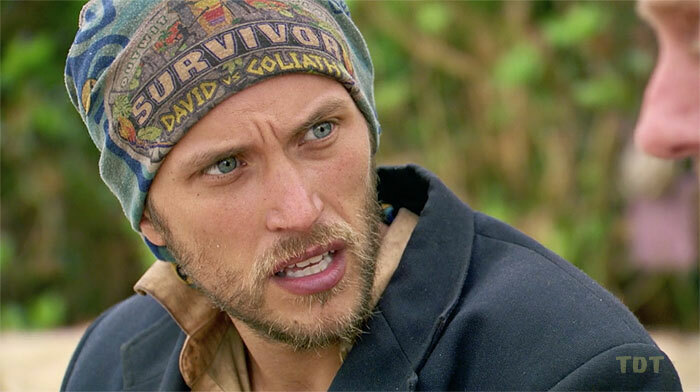 Speaking of Ben, Christian pretty much has to pull off what he did to win at this point. While I’m firmly a fan of Christian (my pre-game assessment be damned) I still wouldn’t quite want that to happen. 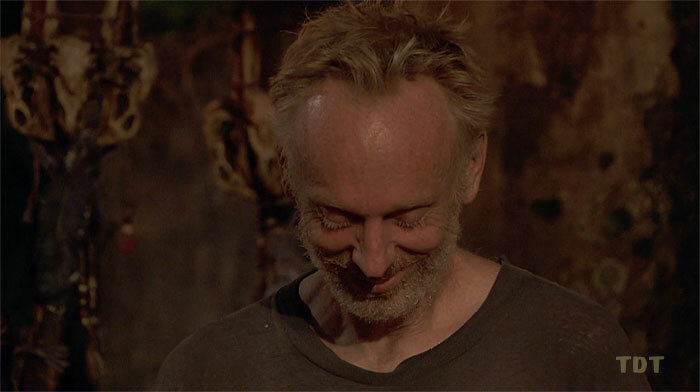 Christian still has the brainpower to pull off something wild, so he definitely has more than a 0.0% chance of still pulling it out, but his target is bigger than it’s ever been and I don’t realistically see him going all the way. 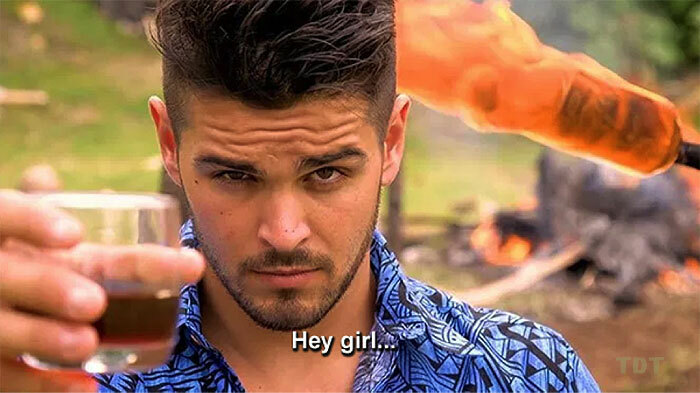 I hope he survives next week at least only to give us a few more minutes of fun in the finale.